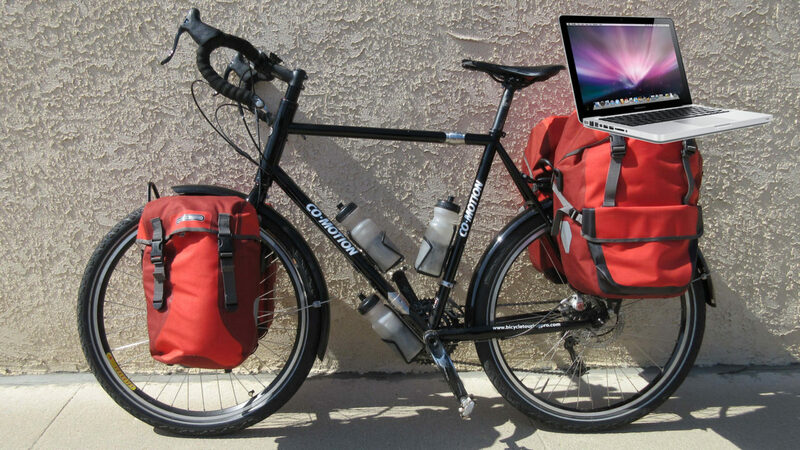 It’s easy to carry a laptop computer on your bicycle and keep it safe from the bumps and vibrations of the road. Just follow the 9 simple steps in this article/video! The first step to safely cycling with your laptop computer is making sure the computer is off. It’s better for your laptop’s overall safely if the computer is off and the hard drive isn’t spinning. The next thing you want to do is… you want to get a lightweight padded laptop sleeve to act as your laptop’s first layer of protection from the bumps and vibrations of the road. Practically any padded laptop sleeve or case will work, but I recommend getting the lightest and softest (most-padded) laptop sleeve you can find. This step isn’t 100% necessary, but for even more protection (and peace of mind), I recommend sliding your laptop computer, which is now inside a padded laptop sleeve or case, inside the padded laptop sleeve of a small backpack. Many small backpacks today come with padded laptop sleeves, so you want to make sure you’re using one of these special backpacks, and not just an ordinary, non-padded backpack. This backpack is useful for not only carrying a laptop computer on your bicycle, but also for walking around off your bicycle and carrying your belongings around with you when you are away from your bike. Now place the laptop’s power charger and any other cables or accessories you might be carrying with you inside a separate pocket inside your backpack. In addition to the power charger, you might also be carrying USB cables, an external hard drive, an international power converter, or any number of other electronics and accessories. All of these items can be carried inside the same backpack which is carrying your laptop computer. Now slide that entire backpack inside a large, waterproof bicycle pannier. It’s important that this particular bicycle bag be waterproof – especially if you think you might encounter rain or snow during your time on the bike. I recommend the Ortlieb Bike-Packer Plus panniers, because they are large, good-looking, waterproof, and easy to use. This particular bicycle pannier is not cheap, but if you want to make sure your laptop computer is going to be safe and protected from the elements, then I highly recommend it. If you’ve still got room, you can pack and carry other lightweight items inside the same pannier carrying your laptop computer. Clothing, shoes, and other lightweight items can be carried inside this pannier. If you have other heavier items you wish to carry with you on your bicycle, it’s a good idea to place them in a separate pannier on the other side of the bicycle – this way you are evenly distributing the weight across your bike. It’s very important that you not pack or carry any liquids inside or on top of the pannier carrying your laptop computer. Water/soda bottles, toiletries, or any other form of liquids should be carried in a separate bicycle bag or pannier. You don’t want any of those liquids to spill inside the pannier and saturate your laptop computer as you ride. The best place for your laptop computer to ride is on your bicycle’s rear rack. Make sure the pannier is mounted securely to the rack and won’t shake or jiggle off the rack once you hit the road. I like to carry the pannier containing my laptop computer on the right-hand side of my bicycle, as this is the same side of the bike where my chain and derailleurs are located. When I park my bicycle, I lean the bike up against a fence or wall on the bicycle’s right side. Then, if the bike were to fall over, it would fall on its left side, causing no damage to my laptop computer or the bicycle’s gearing. Step 9: Ride safely and watch out for bumps. The only thing left to do now is hop on your bicycle and ride! As you cycle, be mindful of bumps, cracks and holes in the road. If you use this multi-layer packing technique safely carry your laptop computer on your bicycle, you don’t need to worry about every little bump in the road, but you do need to watch out for larger, more challenging terrain. If you spend your time cycling mainly on paved roads, there won’t be anything to worry about. But if you find yourself on a long, bumpy dirt road or unpaved gravel surface, you might want to take the backpack out of your pannier and ride with it on your back – as your body does a better job of absorbing the bumps of the road than your bicycles does. Then, once you get back on a smooth road again, you can return the backpack to the inside of your waterproof pannier and continue down the road. This entry was posted in Bicycle Touring Pro Articles, Electronics, Featured Articles, Featured How-To Articles, Main Featured Articles, Uncategorized, Videos and tagged adventure cycling with a computer, bicycle touring with a computer, bicycle touring with a laptop, bikepacking with a computer, carry laptop computer, computer, cycle touring with computer, laptop, laptop computer.